Those of you who have been here for a while know that many violin students tend to plateau for a while and then make sudden, unexpected jumps in capability. I think that just happened for me. I’ve been in status quo for six months despite really being mindful with my practice. Tonight I picked up a book of compiled pieces and played it from beginning to end, even though previously I only knew one piece in the book. The pieces increased in difficulty towards the back of the book, and I found myself easily playing arpeggios in 4th and 5th position without stopping to think about it. I put down my violin and thought “What just happened?”. It was so completely unexpected. Here, I’ve been dutifully slogging through Vivaldi’s A Minor Concerto, wondering if I was ever going to make any progress. When suddenly, I’m playing it nearly from memory and sight reading pieces of similar difficulty. What??? Merry Christmas to me. Watch out, Bach Double, here I come! So what changed? About eight weeks ago I joined an adult string ensemble. I had to learn new music for that. I also had to up my game on sight reading, including dynamics, which honestly I have sort of ignored since day one. My teacher has also had a couple of studio practices for Christmas carol music and a couple of associated performance opportunities. Last year I played violin I. This year he asked me to play violin II. I had to sight read, and fast, because V-II does not follow the melody at all, so I couldn’t cheat and play it by ear. It must have been just the push I needed to level up. I’ve done one of the studio Christmas performances so far this year. Last year, I was so nervous, I could barely play. This year was much less stressful. Usually I’m the only adult that shows up to these things. For this performance, I finally met another adult student. His name is Tom, and he has been playing for just a few months less than me. He said it was his first time performing, and I think he did a bang-up job. Seeing how nervous he was, made me remember all the same feelings I had this time last year. I hope he keeps performing. It just gets easier and easier. Plus, it’s no fun playing at home for the cat all the time. Music is meant to be shared. Speaking of sharing, my husband took a picture Saturday night, but it turned out really blurry. I still like it though, so I’ll post it. 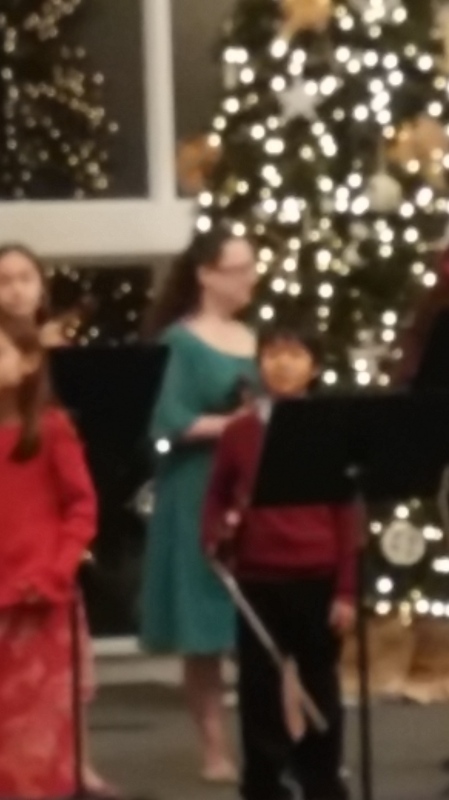 Bonus, I don’t have to blur out the faces of the kids from the studio because it’s already done. I’m the one in green. Thank you. I hope it becomes an ongoing tradition. That would be wonderful!